I've not written my blog for a few weeks. But my summer vacation was over, so I can write it more from now on!! !：） I love animals:)! I often go to the Lake that is near my house, and enjoy looking wild ducks. They are so pretty!! One day, I went there with my mom, and I saw them as always. We fed a piece of bread to them, and many ducks came to us to eat food. We found five baby ducks from them then!!! They were so fluffy, and small! So cute;D!! Those babies hung around their mom duck. We noticed that each of them had characteristic. The biggest baby was very naughty, and he always chased water striders to eat! The second biggest baby was naughty too, and he always headed their procession. The medium-sized baby was curious, and he always went somewhere, so his mom had to look for him any time. The second smallest baby was cleanly, and she always mended her hairs. The smallest baby loved her mom, and she imitated her mom's behavior. They were very friendly, and they approached us. I wanted to touch them, but their mom watched me with a pierchin look, so that I couldn't. But I could watch them under my eyes:)!! 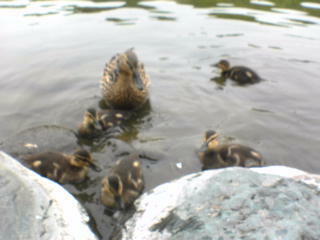 To see them, I and my mom haunted the Lake once a week!! They became bigger and bigger, but the number of them reduced after three weeks....we could only see two babies. I wondered why. I guessed that someone picked them up, and took them to their houses. I asked managers why. He said, "Oh, I think that some crows catched and ate them...that's terrible." I was shocked and I was about to become to hate crows!!! But I thought that crows ate them to live.....mmm....it's difficult problem. I think you would like it here where I work. My office is next to a canal, and there are always many birds to be seen! This week there have been Ducks, Canadian Geese and a pair of Swans!!! Hey, Colin;) How are you doin'? Wow! I wanna go there someday if I have a chance!!! I love watching wild animals very much, but I don't like zoos so much because I want such animals to live in the natural world!! I'm sorry about that. But I like safari parks:)! Anyway, I wanna visit that canal once:D! Happy you're back girl. I miss my Japanese lessons. The spotbill ducks are so cute! I used to go to the river that near my house when I was a little, and I saw many spotbill ducks then. Hey! Welcome to my blog;D! i have been on a holiday too but now i am back! i also like ducks and sometimes feed them bread but they don't like it if you put jam on it so i have to eat it instead. I'm glad that you are back!! !